The NuWave precision induction cooktop platinum (PIC platinum) offers precise temperature control with the simple press of a button. With an expansive temperature range, adjustable in 5-degree increments, the 1800-watt PIC platinum can cook as low as 100 DegreeF and as high as 575 DegreeF. The PIC platinum even boasts a convenient numeric keypad for easier operation, a programmable clock, as well as a remote so you can adjust your cooking temperature from the other side of your kitchen. You can even program and save up to 150 recipes, in addition to the 50 pre-programmed recipes, thanks to the PIC platinum's memory function. Instructions, manual's, registration card, quick start guide, and some recipes are all printed in Spanish and English. A lot of advanced and exciting features for 2017, including choose your own watts power selection, pause and serve function, auto shut off, and other safety and convenience features. See owner's manual for complete manufacturer details/recommendations. Energy efficient- cooktop Transfers heat only to cookware saving time and no wasted Energy. New Features: include programming and ability to save up to 150 recipes, in addition to the 50 pre-programmed recipes, thanks to the PIC platinum's memory function. Versatility and Precision through the easy push button adjustable watts selector of 600, 900, 1200, and 1800 watts. Pause and serve function as well. Manual in Spanish and English. 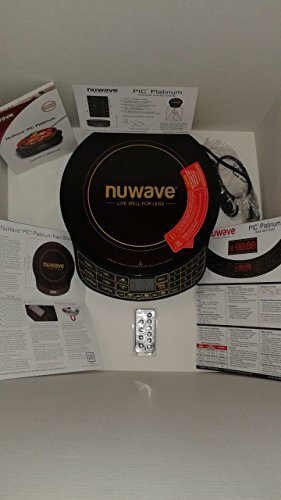 If you have any questions about this product by NuWave, contact us by completing and submitting the form below. If you are looking for a specif part number, please include it with your message.